Spring is pretty much here excepting a few occasional snowflakes. 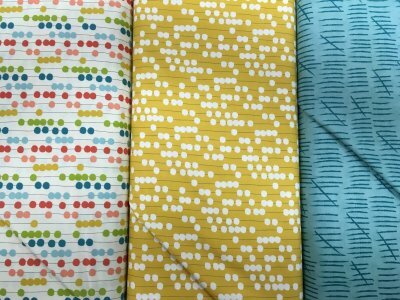 We are excited about our new fabrics, new patterns and kits. We've been looking forward to Spring, it brings many wonderful celebrations... Easter, Mother's Day, Graduations, Weddings and the like. We cannot wait to help you with those Graduation gifts, baby or wedding gifts. Let us know what you are working on- We can inspire you and we get inspired by you! On a much sadder note, we regret to announce the passing of our beloved shop dog, Saige. Despite enduring pain daily, she loved coming to the store and greeting our customers. 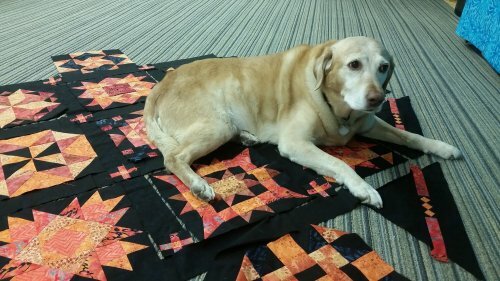 She especially loved giving her approval to the quilts and sleeping through classes. We miss her dearly. 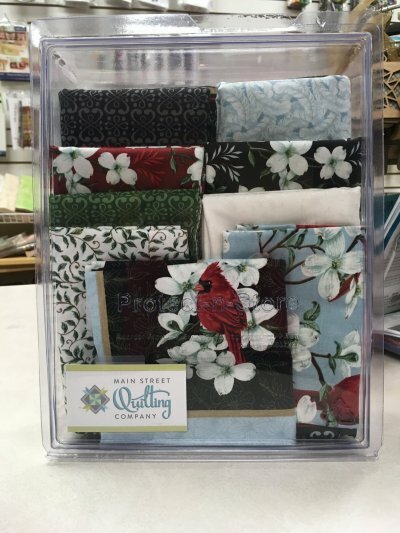 Main Street Quilting Company is joining with the Silver Thimble in Bozeman, Thimblelina's & Back Porch Quilts in Livingston, and Little Timber Quilts in Big Timber for a Spring Shop Hop. Stop in on April 6,7,8 and see what fun you can have hopping into Spring. 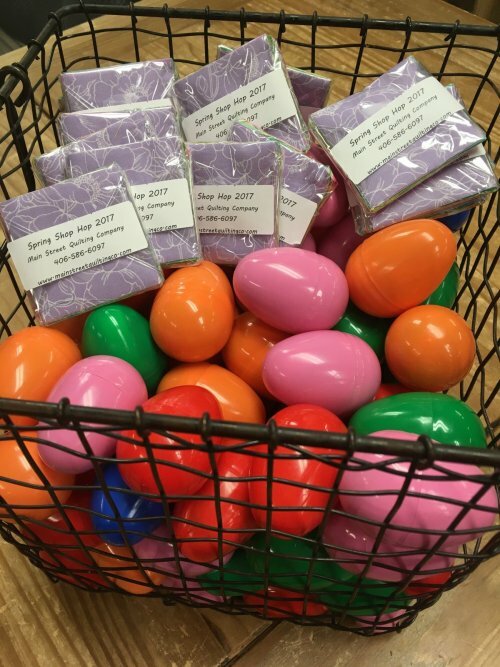 All participating shops are offering a Easter treat and a chance to win gift certificates. All shops will be open Thursday and Friday 9am-6pm and Saturday 9am-5pm. Come in with your passport or pick one up at our store. Don't miss out on the fun! We are still working on the Sew into It kit from Hoffman. 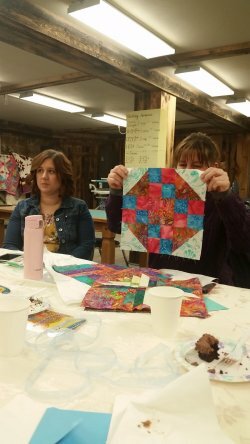 Kit is pre-cut, pre-notched, and includes directions, but class makes this challenging project fun and sociable. 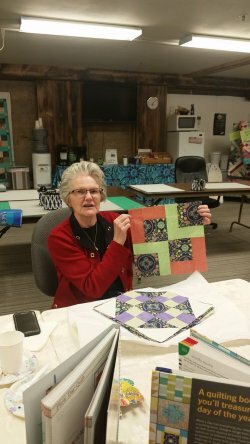 Gwen walks you through that delicate piecing. Required kit has three color options, stop in and choose your favorite! Each class works on one section. Cost: $15 per class. 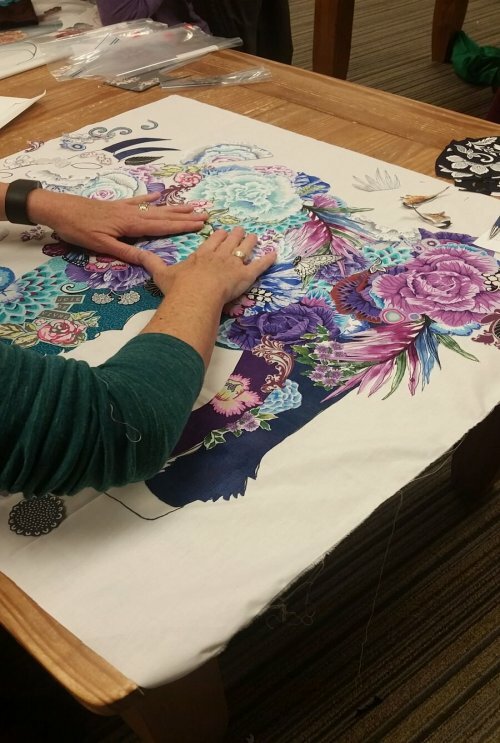 Join us on the last Weds of each month as we learn about Bernina's latest Version 8 software release can do. Cost: $10. We welcome kiddos from age 6-10 are as we make small projects which can be completed in one or two sessions. Each kiddo will need to bring a machine, and project supplies will be available for purchase at class. Each student must know how to work their sewing machine (and wind a bobbin) and bring basic sewing supplies. Please call ahead to reserve a spot as we have a little prep ahead for this class. Cost: $20 includes supplies. Birthday Club is starting again and this time we have TWO sessions going! We'd love to have a third session so if you are interested in joining in the fun- Call us ASAP and get on the list. We would need 11 more people to join to make up the third session. 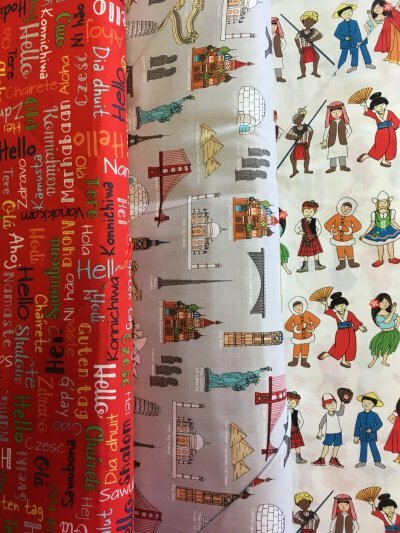 Here are a few of the logistics (more details are provided on the info sheet when you sign up): You provide 1.5 yards of fabric purchased from our store (if you have your own there will be a small registration fee assessed). 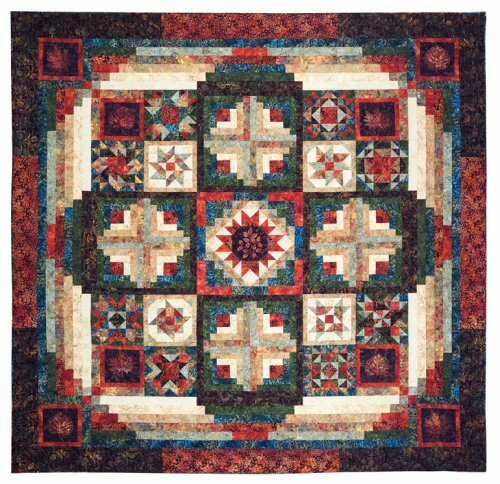 Each month of you will pick up fabric to make a 12 1/2" trimmed block. 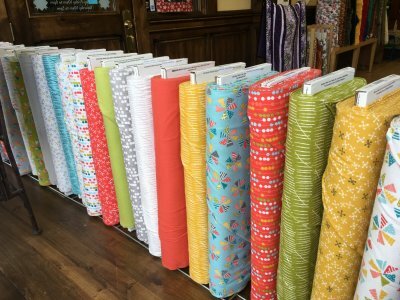 Drop off that block and pick up the next months fabric. You can work ahead if you need. When it's your "Birthday" month, you will still make a block to turn in. 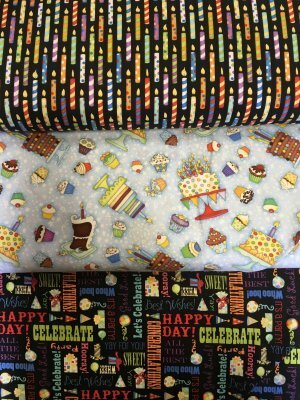 On April 13, 2018 we will have a Birthday Party and you will receive your gift (12 blocks made just for you!) Here are a few of the photos from our party a few weeks ago. Ladies, If you have already joined- I will be sending a separate email with the dates and times of a special Birthday Block Class. Poetry Prints. Florals with corresponding textures. Mixed Bag. Teased in last newsletter, we now have the line in addition to some pre-cuts. We also have the line in FLANNEL! 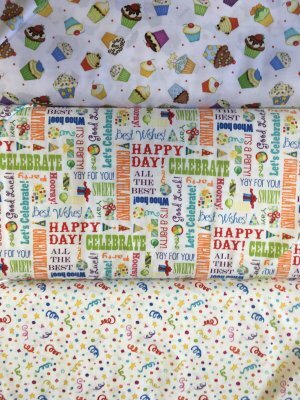 Fun, modern, and mixable with so many other fabrics. Sunday Supper. We have many pre-cuts and coordinating bolts. Line primarily consists of blues, teals, grays, and yellows. 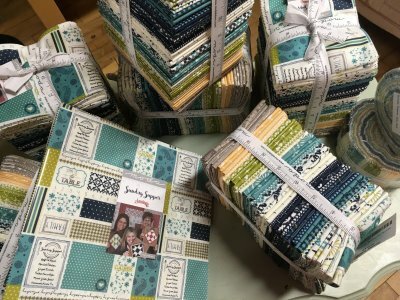 These fat quarter bundles are perfect for the Yellow Brick Road pattern or any FQ pattern. We Share Our World. Find the Taj Mahal, Big Ben, The Great Wall, and Easter Island all in one place! Line has famous landmarks, phrases from multiple languages, and people of all cultures living together. 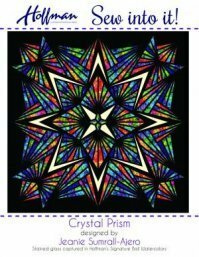 Multiple vibrant color variations. Happy Birthday! 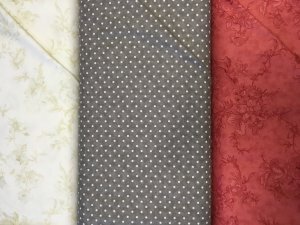 We've now got the fabric for the celebration, no matter the age. This line is going fast- don't miss this one. Storybook Americana. 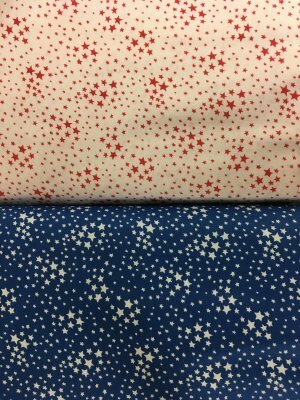 A 30s inspired reproduction line great for summer 4th of July projects. Plus, the cats dangling around U S A blocks are just adorable. Just finished kitting a new Kaffe kit and we are already thinking about cutting more kits. If you haven't seen it in our front window, it's really pretty. Kit comes in a reusable box. Dogwood Kit. 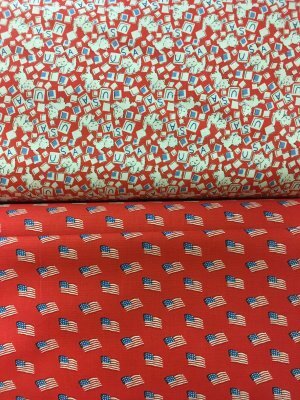 We have a new kit using your favorite cardinal and dogwood print. 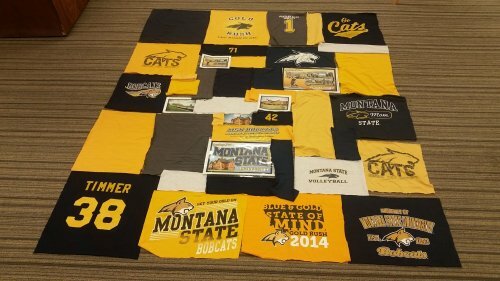 The quilt is currently being made; we'll get it back soon so you can see it. Kit comes in a reusable box. 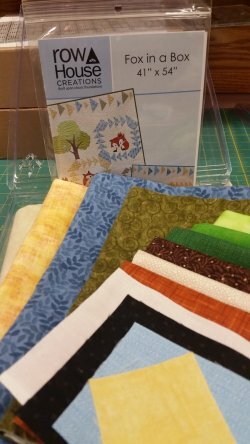 Fox in a Box Kit- This is the cutest thing- You will just have to make it! 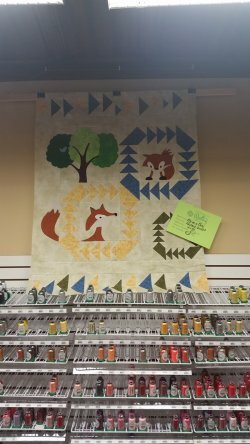 Gwen saw this pattern on a recent trip and loved how adorable this was. Kit comes in a reusable box. 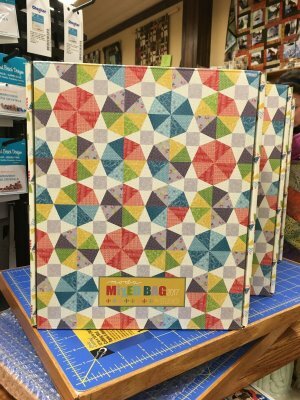 Designed as a monthly mini-kit, get a section each month and easily assemble a quilt over 6-12 months, depending on the length of kit. 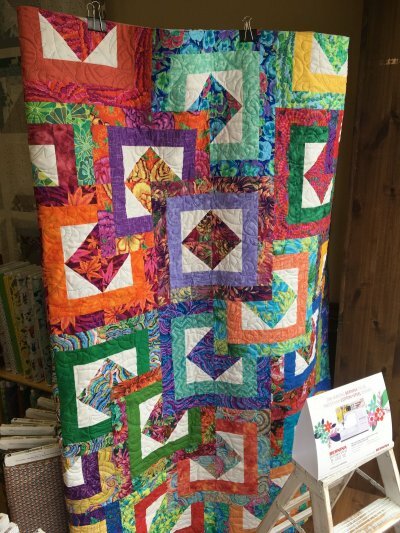 Come in and look at this beautiful 106" square log cabin-esque quilt featuring rich jewel tone batiks. $36/registration fee. $25.50/month for 12 months. 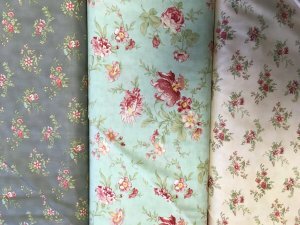 The fabrics are so much prettier in person, especially the corner leaf print. You will not want to miss this one! 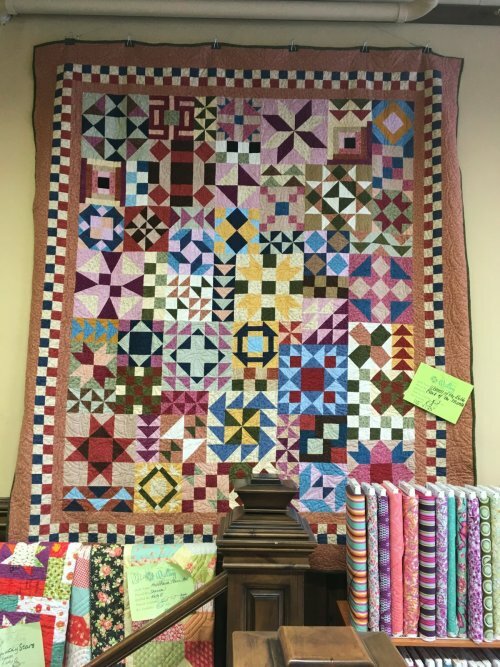 A huge flannel quilt which we backed with minkee, making it perfect for winter nights. 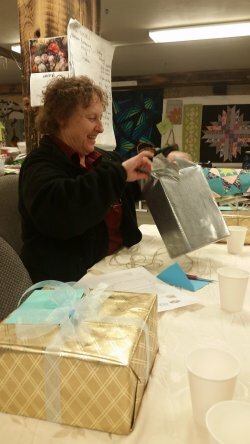 Each month you'll receive material to make 3-4 blocks along with interesting information on Women in the Bible.